HBase is an open-source distributed non-relational database written in Java. It has become one of the dominant databases in big data. It is developed as part of Apache Software Foundation's Apache Hadoop project and runs on top of HDFS. 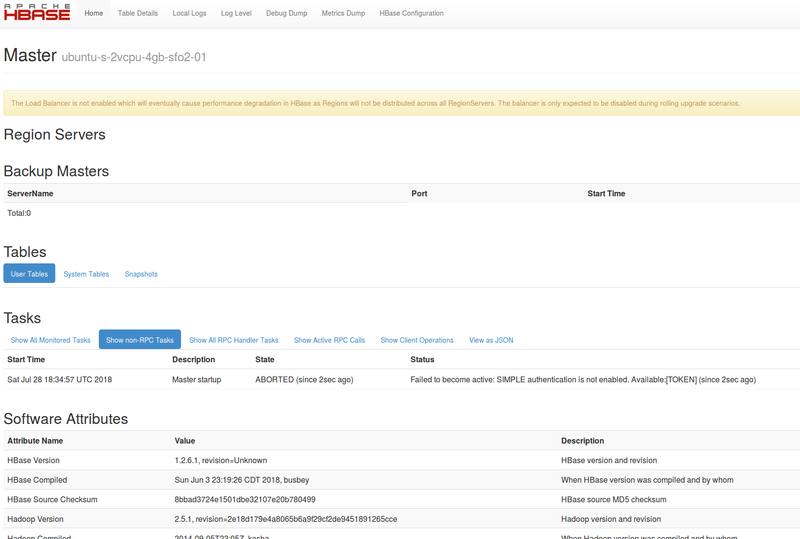 This post demonstrates how to set up Hadoop and HBase on a single machine. Running HDFS, YARN and HBase on a single machine is a quick way for testing Hadoop system. I will install Hadoop on a brand new virtual machine, so that every step is covered and can be duplicated. There are a number of different ways to build a Hadoop cluster, such as using Apache tarballs, using linux packages (e.g. RPM and Debian) and using Hadoop cluster management tools (e.g. Apache Ambari). 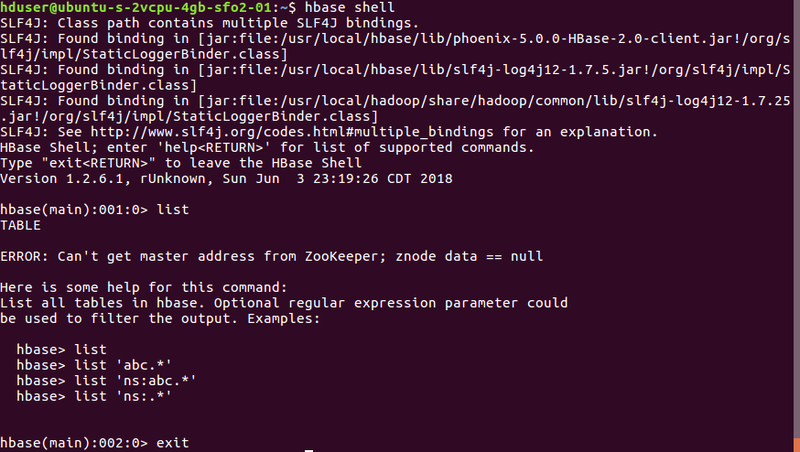 This post shows how to install Hadoop using the Apache tarballs. This is a good way to understand how to configure a simple Hadoop cluster. 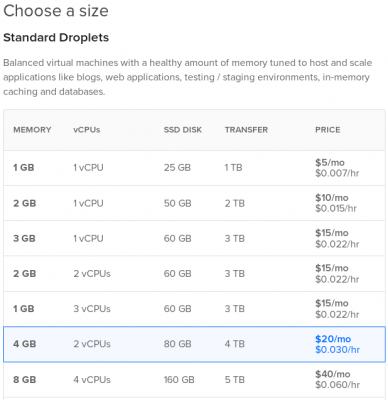 To have a brand new linux box, I created a VM on digitalocean.com. The linux version used is Ubuntu 16.04.4 X64 and the VM has 4G memory. It is recommended to create a user instead of running on root. Create a group 'hadoop' and a user 'hduser'. And grant root permission to the user. Hadoop requires SSH access to manage its nodes. Therefore, we need to configure SSH access to localhost for the hduser user we created. The second line will create an RSA key pair with an empty password. We don't want to enter the pass phrase every time Hadoop interacts with its nodes. The following commands enable SSH access to the local machine with this newly created key. Install Oracle's JDK version "1.8.0_181". Verify the installation of Java. The available Hadoop releases are available at http://hadoop.apache.org/releases.html. The only required environment variable we have to configure for Hadoop in this tutorial is JAVA_HOME. Open hadoop-env.sh in the editor of your choice and add the following line to set JAVA_HOME environment variable to the Oracle JDK 8 directory. Test the download with the example mapreduce job. In this example, we count the number of occurrence of "file[.]*". Set HADOOP_HOME and PATH by adding the following lines to the .profile file and source it. The core-site.xml file contains information of common settings, such as the port number used for Hadoop instance, memory allocated for file system, memory limit for storing data, and the size of Read/Write buffers. The hdfs-site.xml file contains information such as the value of name node path, secondary name node, and data node path of your local file systems, where you want to store the Hadoop infrastructure. Edit yarn-site.xml (under /usr/local/hadoop/etc/hadoop). The yarn-site.xml file configures settings for YARN daemons: the resource manager, the web app proxy server, and the node managers. This file is used to specify which MapReduce framework we are using. By default, Hadoop contains a template of mapred-site.xml. ubuntu-s-2vcpu-4gb-sfo2-01: Warning: Permanently added 'ubuntu-s-2vcpu-4gb-sfo2-01' (ECDSA) to the list of known hosts. Check DFS Health using portal at http://your_ip_address:9870/dfshealth.html. 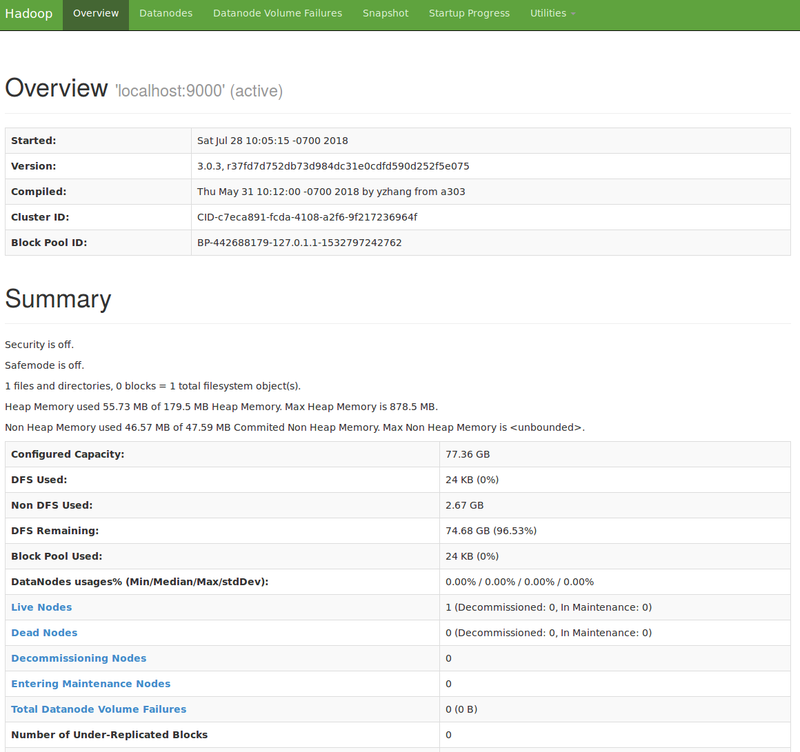 Check Hadoop Cluster Overview at http://your_ip_address:8088/cluster/cluster. The available release of HBase is located at: http://www-us.apache.org/dist/hbase/. Version 1.2.6.1 is used in this tutorial. Add the following line to ~/.profile and re-source it. Edit JAVA_HOME in shell script hbase-env.sh under folder /usr/local/Hbase/conf/. Now start hbase, and check master status at: http://your_ip_address:16010/master-status. The following command shows how to create a table "test" with one column family "info" and add a row. If you are interested, you may also check out some Java code examples for showing how to use HBase in Java. But you didn’t mention that wget hadoop should be proceeded from /usr/local/ dir. By default it will download an archive into home dir. If you copy-paste – do it for all text.